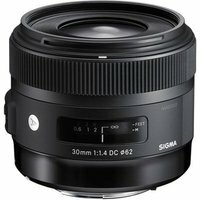 The Sigma 30mm f/1.4 DC HSM is a fast aperture f/1.4 lens with an angle of view similar to that of human vision. From 40cm (15.7) minimum focusing distance to infinity, this prime lens creates very sharp, vivid and detailed images and is suitable for cameras with an APS-C sensor. From an early stage, flare and ghosting are thoroughly measured to establish the design which is resistant to strong incident light such as backlight. Sigma's Super Multi-Layer Coating reduces flare and ghosting, and provides sharp and high contrast images even in backlit conditions. The HSM (Hyper Sonic Motor) provide quiet, high-speed auto-focus shooting, as well as full-time manual focus override, which is important for videographers and those who require precise control. The lens is ideal for beautiful bokeh, snap shots, portraits, landscapes and more.